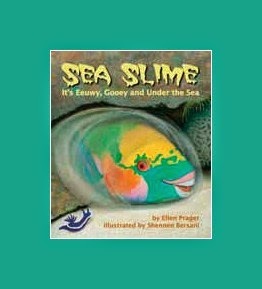 Sea Slime: It’s Eeuwy, Gooey and Under the Sea by Ellen Prager and Shennen Bersani is one of the newest spring titles from Arbordale Publishing (formerly Sylvan Dell). 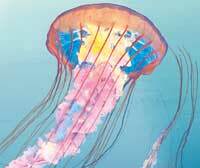 This colorful picture book showcases all the eeuwy, gooey, slimy ways ocean life use mucus to capture food, protect themselves, and travel. What kid wouldn't love a book about slime and goo? This book really makes learning fun! 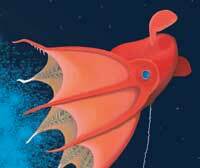 The author, a marine scientist, introduces readers to the exotic undersea world, with its sea butterflies, parrotfish, and vampire squid. This nonfiction book makes the undersea wonders come alive for readers through its engaging text and full-page colorful illustrations. Interesting facts are presented, such as the reason a clownfish doesn't feel a sting and a creature that can create a smokescreen. The Arbordale website has free downloadable teacher helps to accompany Sea Slime, with educational enrichment activities in language arts, reading, science, math, and geography. We couldn't resist making our own homemade slime to play with after reading Sea Slime! Here's an easy recipe for slime, using Elmer's glue, Borax, and food coloring at Steve Spangler Science.